... may have been fairly small as these things go, with just 28 exhibitor rooms, which is way fewer than THE Show Newport Beach a month ago. However, that is still 6 more rooms than the Axpona NYC just two weeks ago, with about the same number of marquee brands, in a hotel with generally better-sounding rooms than New York's Affinia. 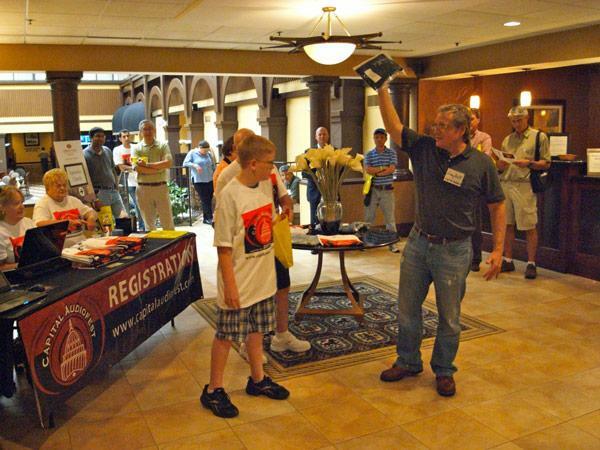 Show organizer Gary Gill, shown here giving away the prizes at the first of the nightly raffles, took a big gamble moving last year's intimate show into a hotel venue, but it seemed to have worked: both exhibitors and attendees seemed very upbeat about the event. Attendance on Saturday evening was a hair short of 700, meaning that possibly 900 or even 1000 people had packed the rooms of the Rockville Crowne Plaza by the time the Show closed Sunday evening. Are regional shows like Gary's the future of the audio market, as Classic Speakers' John Wolff believes, or will we return to the days when there were just one or at most two large shows each year? That is going to depend on the resources of audio manufacturers and retailers and their willingness to spend more time on the road. 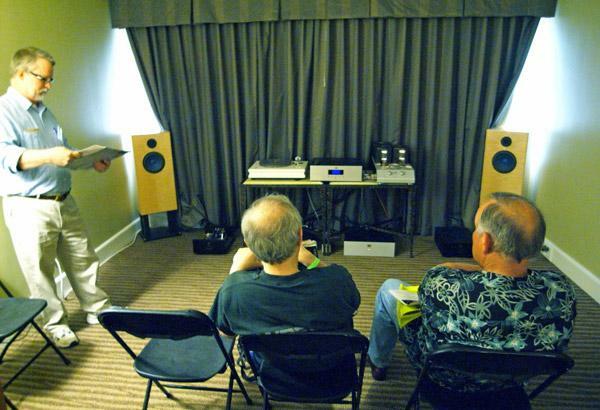 But the 2011 Capital AudioFest certainly proved that if you hold it, audiophiles will come. 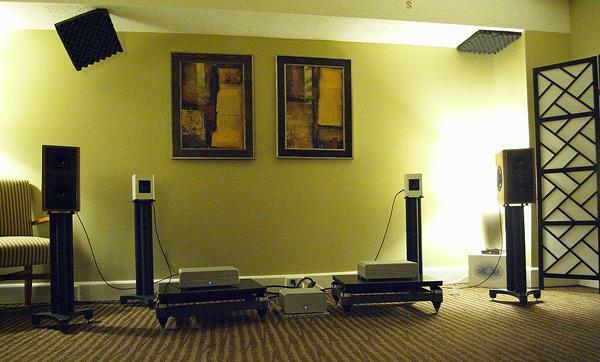 The larger of the two JS Audio rooms featured Wilson Sasha W/P speakers driven by Dan D'Agostino's new Momentum monoblock amplifiers. Source was either a Sooloos system or the Sound Devices digital recorder belonging to Wilson's Peter McGrath (pictured standing on that hotel carpet), both feeding data to Meridian's 808 Mk.3 CD player/digital processor, which also controlled playback volume. My hurriedly scrawled notes say that the Sooloos feed was via Ethernet, but don't hold me to that; the Sound Devices was definitely S/PDIF. The cabling was all Nordost Odin, which may well have cost more than everything else in the system, and the source components sat on a Harmonic Recovery Systems rack, which all involved said was a major contributor to the quality of the sound in this room. And OMG, the sound! Whether it was Peter McGrath's hi-rez recordings or commercial material like Yello's "Stay," you were mainlining the music. Peter asked if he could play some of my hi-rez recordings, and played first the Cantus performance of Eric Whitacre's Lux Aurumque in 24/88.2k fidelity. I was transported to the Sauder Auditorium at Goshen College in Indiana, with the acoustic wrapped around me. The system did subtlety. Peter then played the 24/88.2k master of Attention Screen's "Blizzard Limbs," from Live at Merkin Hall. Again, the acoustic wrapped round me but the drum transients were more startling than I have ever heard before. And I mastered the recording! I have heard Wilson Sashas in a number of systems, and yes, they are "fast," in that the bass doesn't boom or blur. Yes, the Nordost Odin is extraordinarily transparent cable (at a price) and that Meridian player's D/A is top-rank. And that HRS rack is a black hole for vibrations. But driven by the Dan D'Agostino ampswow, did the Sashas kick some awesome booty! Without ever sounding crass or lacking in subtlety. "The Voice That Is" is the name of a Newtown Square, PA, retailer and when I walked into their room, I had no idea what equipment I was listening to, as it wasagaintotally dark! (I had to set my camera's "film speed" to a noisy 1600 to get a photo at all.) But the music playing, Stevie Ray Vaughan's "Tin Pan Alley" took me back a quarter century, when all you heard at audio shows was this cut. But it never sounded this good back then! As my eyes accommodated to the darkness, I could make two pairs of Tidal speakers, the floorstanding Piano Diaceras ($37,690/pair) behind stand-mounted Ameas ($18.990/pair). Both feature ceramic-cone woofers and a diamond-dome tweeter but it was the Diaceras that were playing, connected with Argento cable to a Tidal Impact 140Wpc stereo amplifier ($35,990) and a Tidal Preas preamp ($27,990). Source was a MacBook Pro feeding USB data to a dCS Debussy D/A (my current reference, it shall be said, though in May I loaned it to Erick Lichte, who doesn't appear to want to send it back any time soon). As if to confirm that it was 1987, the next track played was "Le temps passé" from the Michel Jonasz CD L'Histoire de Monsieur Swing. This is what I am talking abouta huge, stable soundstage, extending way beyond the speaker positions; smooth, grain-free highs, tight, tuneful, deep lows, and a pure, coloration-free midrangeand all of this in service of the music, adding to the experience instead of substituting for it. It doesn't get much better than this! The engineer in me just doesn't get the products from AudioNote UK. Unprepossessing, two-way speakers that cost a lot of money; non-oversampling digital products that cost a lot of money; single-ended triode amplifiers that cost even more. But the musician in me makes sure I always check out the AudioNote room at an audio Showa fine time is guaranteed for all! 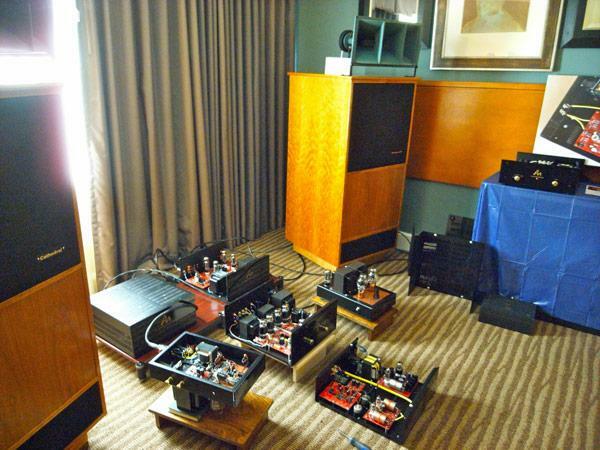 Such it was at AudioFest 2011. When I walked in, David Cope (left) was playing a CD of the Rachmaninov cello sonata on the AudioNote CD4.1X player ($10,500). 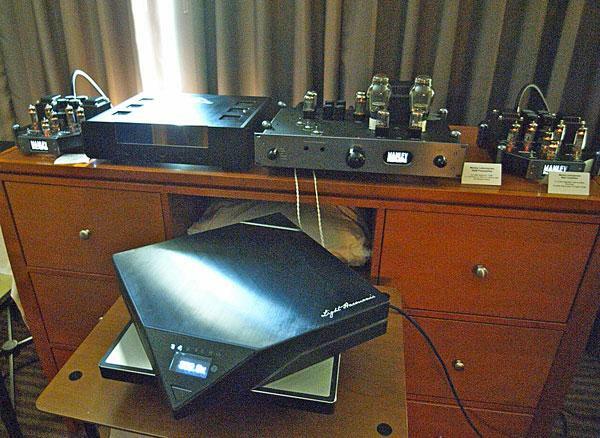 Amplification was being provided by the AudioNote Jinro integrated amplifier that Art Dudley reviewed in April 2011 ($26,500). Speakers were the AudioNote Lexus Signatures, the fourth rung up the ladder on modification of what was once was the original Snell Model E ($16,250/pair; this speaker has external crossovers whereas the three less-expensive models don't). It was with a definite sense of loss that the Rachmaninov movement came to an end. Makes you think. Made me think. Something is going on but you don't know what it is. Do you, Mr. Atkinson? 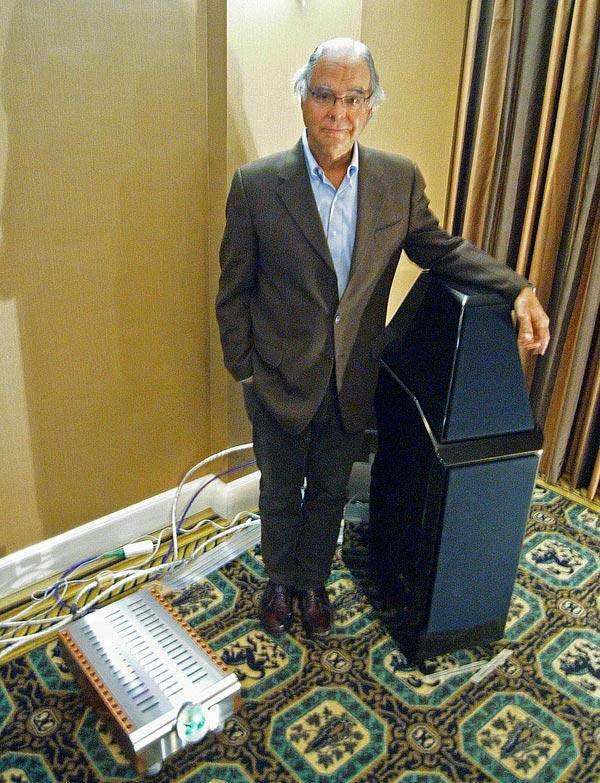 The Highwater Sound room at the Atlanta Axpona had been one of Stephen Mejias's favorites: "I felt as though I were in a concert hall, gripped by the music, by the space around me, by the physical motions of musicians striking, plucking, and bowing their gorgeous instruments. There was a certain sacredness to the scene, a sense that what was taking place should not and could not be disturbed," he wrote. Unfortunately, by the time I got to that room on Sunday, Highwater's Jeffrey Catalano was already striking the system, so I made sure I had plenty of time to visit the Highwater room at Capital AudioFest. Capital AudioFest organizer Gary Gill is a fine jazz trombonist, as I found out when we both sat in with Steve Davis's band at the Atlanta Axpona in April. 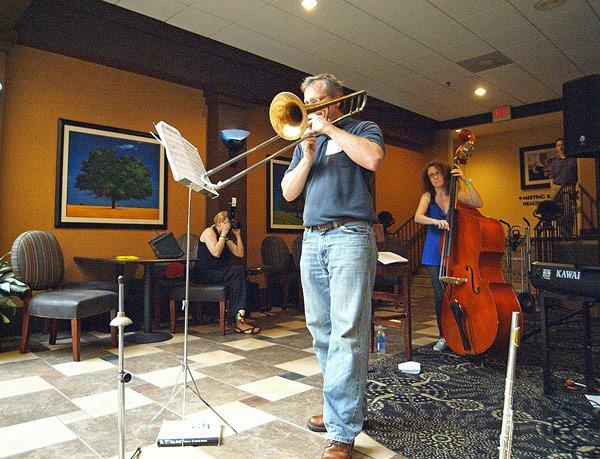 To remind Showgoers what the real thing sounds like, Gary's quintet performed Saturday evening in the hotel's bar. This is Gary in full song, but not shown in my photo are the, not one but two Theremin players who sat in on some songs. 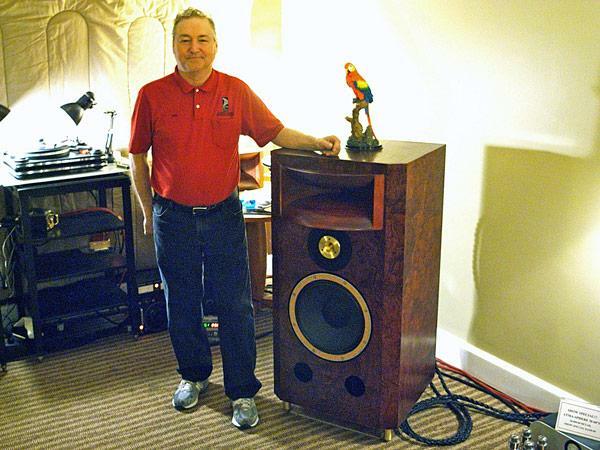 Classic Audio Loudspeakers' John Wolff, along with his red shirt, the parrots that perch on his speakers, and the reproductions of Nipper he offers for sale, is a fixture at regional audio shows. When I asked him about this, he responded that he believes regional shows are the future of this industry. 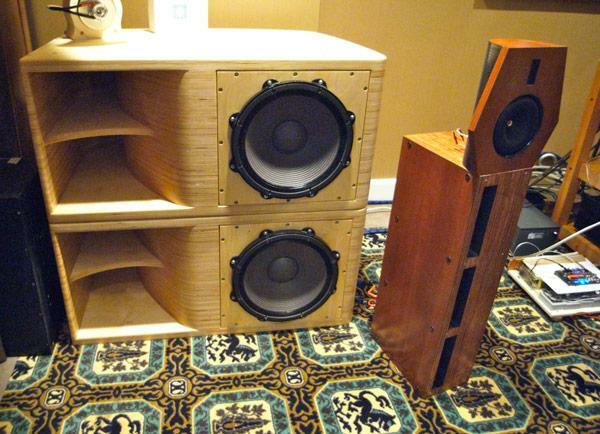 John was using Atma-Sphere tube electronics, including M-60 monoblocks, to drive his 4'-tall T-3.4 speaker, which uses a wood radial Tractrix midrange horn fitted with a 4" beryllium-diaphragm compression driver firing into a 2" throat, coupled with twin 15" woofersone firing forward, the other to the floorand a supertweeter. The midrange unit and woofers all use field-coilenergized magnets. "Concrete is toxic to the sound of speakers!" 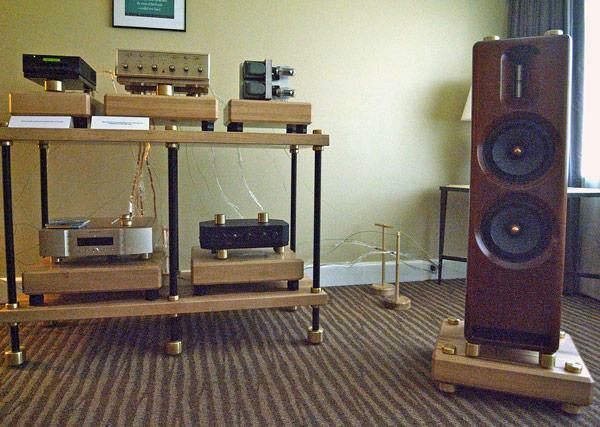 explained Mapleshade's Pierre Sprey, when I asked about the maple platforms and brass footers on which everything was standing in his room at Capital AudioFest. Pierre makes superbly natural-sounding recordings, but also lives in a world where everything matters when it comes to optimizing sound quality. The system comprised Sonist Concerto 4 speakers ($5895/pair), these a 97dB-sensitive design with a solid poplar front baffle, driven by a heavily modified vintage tubed Scott integrated amplifier. (Pierre has been buying up used examples of this amp since 1989 and offers the modded amps for salesee his website.) Source was a modded Cyrus CD-8SE CD player (the bottom panel was now maple) and preamp was a Kora Triode. Whether it was Pierre's fanatic attention to detail that no-one else considers important, or maybe he is just an expert at setting up systems. But the Sonist speakers sounded very much better than the Concerto 4s and smaller versions that I heard at the Atlanta and Jacksonville Axpona Shows: clean, transparent, and uncolored. 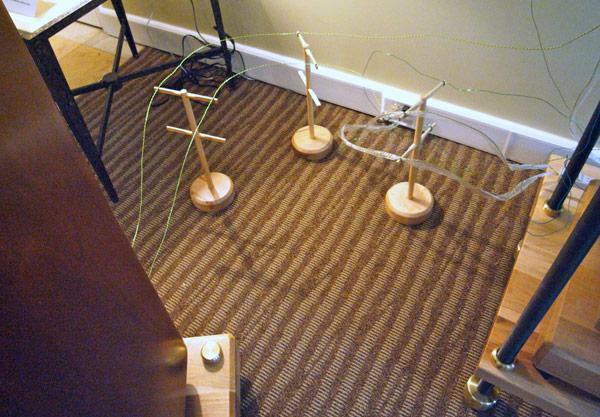 . . .has to be zero, to judge by how Pierre Sprey dresses his speaker wires! 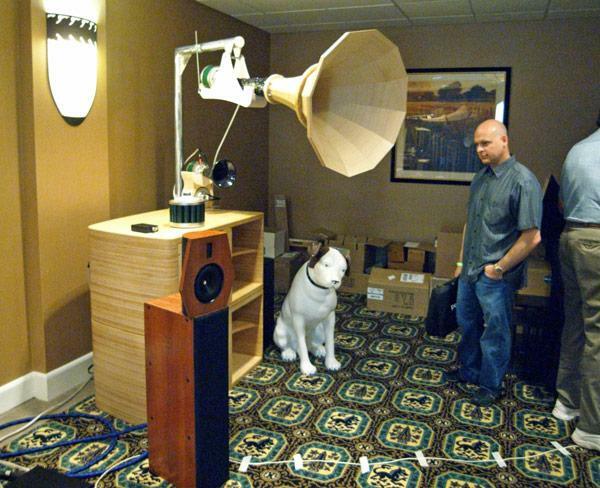 The Surreal Sound Speaker ($10,000/pair) is the small, three-way floorstander finished in cherry, not the massive bass bin behind it, which belongs to the GOTO Horns speaker (see next story). Surreal Sound's Ralph Helmer is passionate about midrange, feeling it is in the midrange where the music truly lives. To that end, his speaker features a beryllium-disc midrange unit, mounted in an open baffle. A Heil Air Motion Transfomer supertweeter and three spider-less, aluminum-alloy, 10" cone drivers for the bass, all also mounted in open baffles, complete the drive-unit line-up. Mr; Helmer believes that one of the advantages of his dipole speakers is their high Wife-Acceptance Favor, in that they are smaller than expected for same amount of bass. These $150k/pair monsters weren't playing either time I went into this room. But they win the prize for most "Awesome-Looking Speaker at the Show." And there's my favorite hotel carpet again! One of the Command Performance AV rooms at Capital AudioFest featured Carnegie speakers, the CST-2 ($5999/pair), which combines a Mylar-film planar tweeter with eight 5.25" composite-cone woofers in a slim tower supported on a marble base. The speakers were driven by Manley Mahi EL84 monoblocks and a Manley 300B preamp, with the source a silent CommandPC server feeding 352.8kHz USB data to the Light Harmonic Da Vinci DAC that had impressed at the Atlanta Axpona. The DAC has been upgraded since Axpona: when handling 16-bit data, it would pad out bits 1724 with 0s to give 24-bit data, which is standard practice. But in 2s-complement digital arithmetic, which is how audio data are encoded on a CD, there are actually two zero levels: 16 0s but also 16 1s, which represents a magnitude one LSB lower. Light Harmonic's engineers found that if they padded 16-bit data with 8 1s rather than 8 0s, the sound improved. This room was pitch-black when I went in, so, sitting in the listening chair, I held my camera over my head, crossed my fingers and my heart, and pressed the shutter. What the flash revealed was a nicely finished pair of 2-way towers, the Carnegie CST-1s ($1999/pair) driven by an Onkyo Reference M-5000R 150Wpc amplifier. The CST-1 combines a 1"x3" Mylar-film planar tweeter with two 5.25" composite-cone woofers in a transmission-line enclosure. Carnegie's Ron May asked if I would like to hear some Nils Lofgren but to my surprise, he didn't select the track "Keith Don't Go" from the Acoustic Live CD, which has been a fixture at recent audio Shows. Instead he played me "A New Shoulder to Cry On," which sounded excellent. Carnegie is designing its products for the "Affordable Audiophile," an admirable goal. 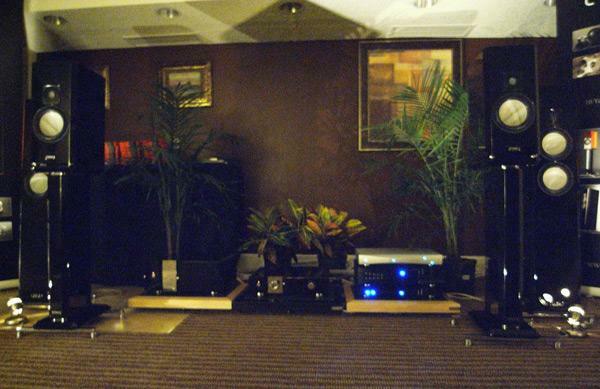 The Audience room was featuring the Clairaudient 2+2s ($5000/pair) when I popped in for a listen. This speaker features four metal-cone units, two on the front two on the back, operated full-range, and reinforced by a passive bass radiator on one of the speaker's sides. Brian Damkroger enthused about the clarity conferred by the absence of a crossover when he reviewed the speaker in the July 2011 issue, but I was less keen on its balance, finding it very forward. 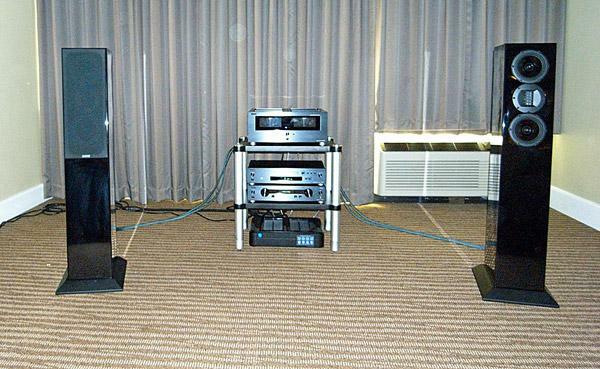 Both aspects was readily apparent at Capital AudioFest, though I admit the room's acoustics were problematic. This is definitely a speaker that you must audition for yourself. This room was packed each time I poked my nose in, so I didn't get much of a listen. The company's websitewww.cathedralspeakers.comexplains that "Once you hear your favorite music on a pair of Cathedrals, you will never go back to ordinary speakers." Driven by kit versions of AudioNote tube amplifiers, the big, two-way Cathedrals feature Eminence woofers in enclosures fabricated from hardwoods rather than the usual fiberboard, and produced an equally big sound. Price is $6995/pair for the Model 3113 being demmed, which has an Altec 811-B horn, $7995 /pair for the 7117, which has an Altec 511-B horn.